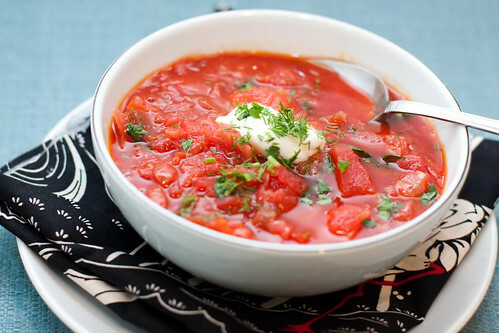 I was introduced to this soup by my Russian-born husband and it has become one of our staple, deeply comforting foods. There are probably thousands of variations on the ingredients and techniques of making borscht, and having looked through a number of recipes, it seems as though the only thing they have in common with each other is the use of beets. 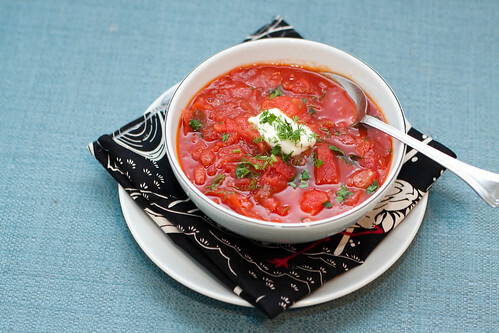 This version of borscht is more akin to a vegetable soup, unlike the classic Ukrainian borscht which uses beef stock, ham and other meats. There’s a fair bit of prep work required, as each vegetable will need to be peeled, diced, shredded, grated, and added to the pot in a particular order, but it’s well worth it to ensure proper cooking of the vegetables. Note that this recipe calls for the beet to be grated, and I have since learned that raw beets spatter a lot when they are being shredded. I’d wear an apron, as your workspace will look like a crime scene from Dexter when you’re done. This soup tastes best if it’s allowed to stand for a few hours before serving. The flavours only continue to deepen and improve overnight. Melt the butter in a large soup pot (at least 6 quarts) over medium heat. Add the onion, carrot and bell pepper. Saute until the onion is slightly softened, 5 minutes. Stir in the cabbage, beet and celery and continue to saute, stirring and tossing occasionally, for about 10-15 minutes until the cabbage has wilted and softened. Stir in the apple, potatoes, tomato paste and garlic. Add the stock and bouquet garni and bring to a boil. Reduce the heat and simmer, covered for 20 minutes. Turn off the heat and add the paprika, lemon juice, sugar, salt and pepper. Taste the soup – it should be savoury and slightly tangy. Add more lemon juice and salt as needed. If you can, let the soup stand for at least 2-3 hours or overnight. Serve the soup garnished with lots of dill, parsley and a dollop of sour cream. This recipe comes to you inspired by the Alembic, a gem of a bar in our neck of the woods. This is a a place that really cares about the craft of mixing a good drink, and making delicious, creative small plates alongside. I’ve whiled away many hours here, happily perched on their suede bar stools, sipping lovingly prepared cocktails and eating handful after handful of the addictive fried shishito peppers they serve as an appetizer. At a recent visit, one of the entrees we shared was a plate of miso marinated trumpet mushrooms, artichokes and brown rice topped with dollops of butternut squash and black garlic puree. 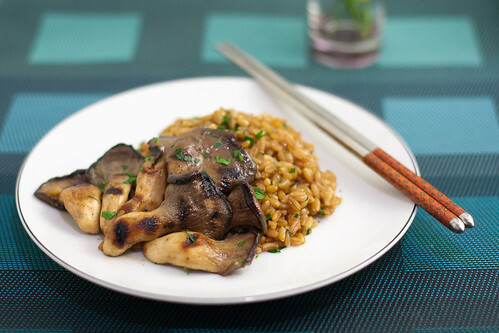 It was a warm, earthy, utterly delicious dish – the nutty brown rice was a perfect vehicle for the juicy, savoury mushrooms and we were trying hard not to lick the plate clean. Back home, I decided to make a homier version of the dish, leaving out the garnishes and focusing just on the mushrooms and the grains. I stirred some miso into a teriyaki-ish marinade, and poured it over a bowl of mushrooms, then let them marinate in the fridge. On finding I was out of brown rice, I made a pot of farro instead and, taking a cue from Thomas Keller’s Ad Hoc, stirred some butter into the farro after it had cooked to give it a luscious oomph. I did use a more modest amount of butter since Thomas Keller has you use an entire stick of butter per pound of farro. I love deriving inspiration from restaurant dishes but I have not mustered up the courage to use butter with abandon… yet. I think that this recipe works best with a hearty wild mushroom like oyster or trumpet, but button or crimini will do in a pinch. I don’t have a grill, so I cook my mushrooms on the stovetop. Feel free to use a grill if you have one. In a large bowl, whisk together the miso, sake, mirin, sugar and soy sauce until well combined. Add the mushrooms and toss gently to coat the mushrooms thoroughly with the marinade. Cover the bowl and let sit in the fridge for at least 2 hours or up to a day. Heat up an oiled grill pan over medium high heat. 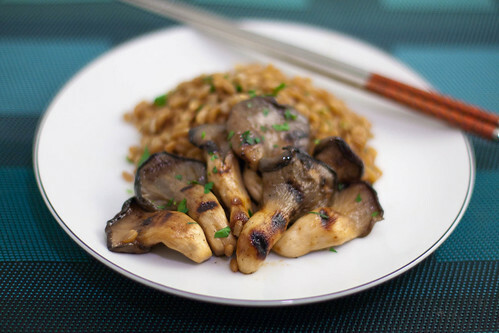 Remove the mushrooms one at a time from the bowl, shake off excess marinade and lay them on the grill pan. Make sure to leave some room between the mushrooms – don’t crowd them. Cook them in batches if necessary. Cook the mushrooms without moving for 3-4 minutes to get nice grill marks, then flip them over and cook for another 3-4 minutes on the other side. Baste them lightly as they are cooking. Remove from the grill and serve warm with buttered farro or brown rice. In a small pot, saute the onion over low heat in a swirl of olive oil for about 10 minutes, until translucent but not browned. Add the farro and saute for another 5 minutes to toast the grains. Pour in the stock, bring to a boil, then lower the heat and simmer, partially covered for 30-40 minutes. The best way to know if the farro is done is to taste it – the grain should be still chewy but tender and cooked through. Add salt to taste, then remove the farro from the heat and let it stand for a couple of minutes. Drain the farro, reserving the liquid. Return the farro and about 1/4 cup of the liquid to the pot. Set over medium heat, add the butter and stir to emulsify the butter with the liquid. Season to taste with salt and pepper.